Chris Poland (born as Christopher Poland on December 1, 1957) is a jazz - fusion guitar player. He started playing in high school in Dunkirk, New York in the rock/jazz band called Welkin. 1977-1982 the fusion band the New Yorkers and is mostly known for playing in the thrash metal band Megadeth between 1984 and 1987. 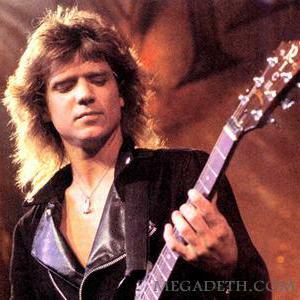 Chris recorded two albums with Megadeth; Killing Is My Business... And Business Is Good! (1985) and Peace Sells... But Who's Buying?(1986). Chris recorded two albums with Megadeth; Killing Is My Business... And Business Is Good! (1985) and Peace Sells... But Who's Buying?(1986). Chris was dismissed from Megadeth after a show in Hawaii (along with the band's drummer Gar Samuelson) under suspicion of stealing and selling band gear to fund heroin addiction. After leaving Megadeth, Chris was successfully treated for substance abuse and joined punk rock legends The Circle Jerks as a bass player. Chris Poland also has a severed tendon on his first finger of the left hand, which allows him to stretch unusually far with his finger, which allows him greater flexibility while playing the guitar. Just before recording his solo album Return to Metalopolis (1990), a fusion/metal record for Enigma Records, Chris turned down what would be the first of two offers to rejoin Megadeth. Damn The Machine, Mumbo's Brain, Nothing if Not and Chasing the Sun were some of Chris' other projects in the mid to late 1990s. His current project is a band called OHM, consisting of himself, bassist Robertino Pagliari and drummer Kofi Baker. Live on KPFK is a live studio recording that really showcases this formidable jazz-fusion trio at its best. In a surprise turn in 2004, Poland was contracted to perform guitar solos on the Megadeth record The System Has Failed (Poland's parting from Megadeth in 1987 was not amicable, as Dave Mustaine would regularly dedicate the song "Liar" to Poland in concert). However the apparent amends made were short-lived as unfortunately, soon after the album's release, Mustaine was contacted by Poland's lawyers, who claimed Poland was due royalties beyond that of his session fees. Though the two weren't on speaking terms for some time, they have apparently made amends once more as Poland is now posting on the official Megadeth message board.